Inspiring the artists and animators of tomorrow, that’s what the Electronic Arts (EA) Teen Scholarship program is all about. Since 2001, EA has been giving teen artists aged 14 to 19 the opportunity to learn from animation and gaming industry professionals, who share their knowledge, passion and experience with the students as guest instructors. The EA Teen Scholarship program, started in 2003, has since launched the careers of 120 gifted Arts Umbrella students to date. On January 17, 2014 EA continued its support of the program, ensuring another 10 teen students get a jump start on their post-secondary studies and/or career in digital arts. Thank you EA for your ongoing support of young, creative minds. 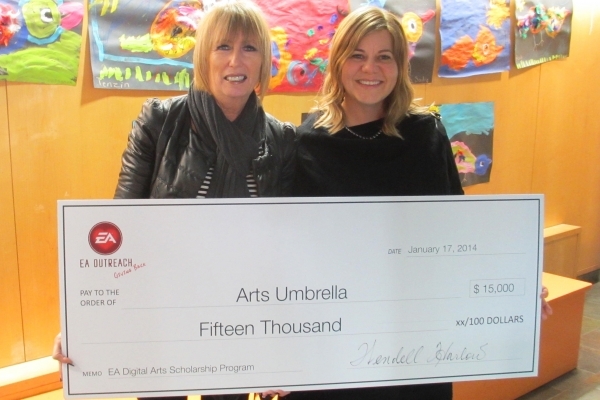 Wendell Harlow (left), Manager, EA Outreach & Corporate Giving presents a cheque on behalf of Electronic Arts to Tammy Danforth, Senior Director of Philanthropy for Arts Umbrella.